The Pocket Diet and Recipe Book is written by George Kashou who is the founder of the bread company Kangaroo Brands and Caitlyn E. Lorenze who is an athlete and registered dietitian. Jenna Bayley-Burke is an award winning chef who created the recipes for the Pocket Diet. The Pocket Diet offers a new twist to the concept of portion control. It is based around eating four or five pita breads daily that are filled with healthy ingredients. As there is a limit to the amount of food that can fit inside a pita pocket, this makes it easy for dieters to stick to appropriate portion sizes. When the diet was tested on 38 volunteers at Community Memorial hospital in Menomonee Falls, WI, they all lost weight with an average loss of 8 pounds over six weeks. Participants of the study commented that the diet was the easy to follow and satisfying. Of dieters who responded to a follow up survey, 3 months after the completion of the study, 79% were still following the Pocket Diet. You are allowed to eat any food so long as it can fit inside a pita pocket. Dieters are permitted 3-5 pita meals daily depending on their goals and activity levels. Breakfast is recommended every day because this will give an energy boost, promote concentration and reduce the risk of overeating later in the day. In between the pita meals dieters are permitted three snacks daily of fruit, raw vegetables, yogurt, cottage cheese, or nuts. Dieters are encouraged to select whole foods including fruit, vegetables, legumes, grains and breads, lean meats and fish. Processed and packaged foods are to be avoided as much as possible. Dieters are also advised to avoid high calorie condiments and instead go for light mayonnaise, low fat sour cream, and mustard. However, on the whole, almost any food can be included in the diet as long as it fits inside a pita pocket. The importance of exercise as part of a balanced approach to weight loss is mentioned in The Pocket Diet. Dieters are advised to go slowly if they are not currently physically active. A combination of cardiovascular exercise, strength training, and flexibility exercises are recommended. Try some of these exercises with the Pocket Diet. 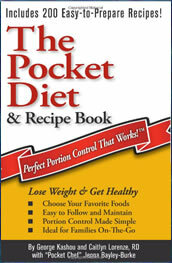 The Pocket Diet and Recipe Book retails at $14. Portion control is a proven method of successful weight loss. Easy to follow and not restrictive in terms of allowed foods. Meals are well balanced and include all food groups. Allows for two to three snacks per day to help to reduce hunger. Good for those with families as there is no need to prepare special meals. Good for busy people as recipes can be prepared in advance. Provides many recipes with nutritional information. Provides guidance on selecting an appropriate calorie intake and planning meals. If white pita pockets are selected the diet could easily become inadequate in fiber. Could lead to diet boredom so that dieters may not stick with the program. Not suitable for those with wheat allergies or intolerances. Not for dieters who do better on low carb programs. The strength of The Pocket Diet is that it is a very easy to follow method that is centered on portion control without the stress of calorie counting and measuring food. Although it is dubious whether this would be a successful plan for long-term weight loss it may be of benefit to teach dieters what is an appropriate portion size. In this way the pita pocket meals can be replaced with other foods since after some time on the diet the dieter will have a better idea of the portion sizes that are required for weight loss.